Our guests are welcome at the Ammos Bar-Restaurant of Hotel Yannis Corfu (in 400 m distance). 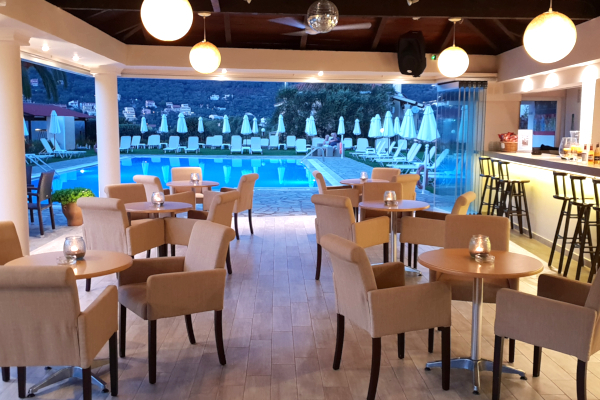 The Ammos Bar-Restaurant is located next to the hotels large outdoor pool. Here sunbeds and umbrellas are provided and the team of Ammos is offering refreshing cocktails, coffee, a choice of finger-food accompanied by ouzo, fresh juices, ice-creams as well as delicious snacks and fresh salads. The snacks and meals are prepared with fresh and locally-grown ingredients cretaed with imagination and respect to tradition.